A nongovernmental organization, The Carter Center is guided by a fundamental commitment to human rights and the alleviation of human suffering. In 1982, Jimmy Carter became University Distinguished Professor at Emory University in Atlanta, Georgia, and founded The Carter Center along with his wife Rosalynn, and in partnership with Emory University. The nonpartisan and nonprofit Center addresses national and international issues of public policy. 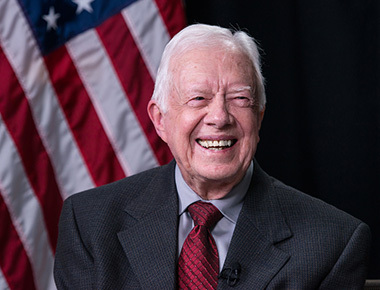 Carter Center staff and associates join with President Carter in efforts to resolve conflict, promote democracy, protect human rights, and prevent disease and other afflictions. The Center has spearheaded the international effort to eradicate Guinea worm disease, which is poised to be the second human disease in history to be eradicated. Rosalynn Carter with the 2014-2015 class of fellows for Mental Health Journalism. Former First Lady Rosalynn Carter has been a driving force in the field of mental health throughout her public service career. She continues her leadership through The Carter Center in Atlanta where she initiated the Rosalynn Carter Symposium on Mental Health Policy, which brings together representatives of mental health organizations nationwide to focus and coordinate their efforts on key issues. With the inception of the Rosalynn Carter Fellowships for Mental Health Journalism in 1996, Mrs. Carter launched one of the most successful international programs in combating the stigma associated with mental illnesses. Responding to the need for local collaboration, she instituted in 1996 an annual Georgia Mental Health Forum for professionals and consumers statewide. Through the Rosalynn Carter Institute for Caregiving (RCI), established in her honor at her alma mater, Georgia Southwestern State University in Americus, Ga., Mrs. Carter addresses the concerns of those who take care of people suffering from mental illnesses and other chronic illnesses and long-term disabilities. Through research, education, and training, the RCI promotes the mental health and well-being of individuals, families, and professional caregivers; delineates effective caregiving practices; builds public awareness of caregiving needs; and advances public and social policies that enhance caring communities. Jimmy and Rosalynn Carter with Ronald and Nancy Reagan outside the Jimmy Carter Presidential Library and Museum in Atlanta, Georgia. Located in Atlanta, Georgia, the Jimmy Carter Presidential Library and Museum is part of the Presidential Library system administered by the National Archives and Records Administration, a Federal government agency. When a President leaves office, NARA establishes a Presidential project until a new Presidential library is built and transferred to the Government. Each President is responsible for financing and building his own library. Once built, the federal government becomes responsible for the administration and operation of the library. Teachers, students, and others come from all over to use the materials in the library for research purposes.